I ❤ temp fields! Temp fields are simple text fields, used mainly by administrators (though I have given access to superusers on a few occasions), to quickly and temporarily tag records with dummy text so you can easily locate those records later in a Salesforce report, an Apsona filter, in Demand Tools‘ Single Table Dedupe, the Apex Data Loader, or anywhere else where you can filter a Salesforce field. Here are a few ways temp fields can be useful and make you an even more #AwesomeAdmin. To test out the examples below, start by creating your temp field. The examples below are on the Contact object but you can create a temp field in any object where it might be useful. Call it whatever you like as long as you know where to find it (“Temp Field,” “Temp Field 1” if you have more than one, etc.). Make it a simple text field, 50ish character count. Make sure that you make the field read-only for all users aside from those who should be updating these fields. 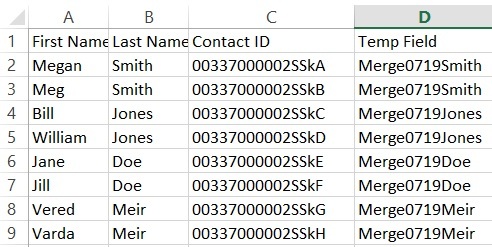 Let’s say a user has given you an Excel spreadsheet with a list of Salesforce IDs, or email addresses, or phone numbers, or names. Maybe the spreadsheet has IDs, maybe it doesn’t. The user wants to be able to run a Salesforce report on these people: their donation history, campaigns they are a part of, etc. The problem is, no Salesforce report filters will be able to match this list exactly because it was generated by the user, or because they took an old Salesforce report and deleted some contacts and added some new ones. Copy and paste into Apsona like you are doing a record update – all you are doing is updating this one field. 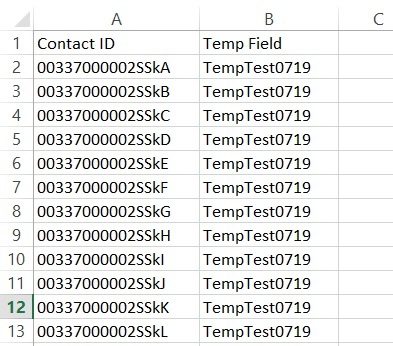 Afterwards, add Temp Field = TempTest0719 (or whatever your value is) as a filter in any Contacts report, and send to your user. Once you are done, clear the temp field or just leave it alone until you need to make your next update – with your next update, you’ll simply overwrite what’s already there. (that’s when having a date in the value comes in handy). See below regarding clearing the field. If you don’t have the IDs: don’t forget that in Apsona, you can map on more than just Record ID: you can also use email, name, name in combination with address, and more. You can follow the same process as above with what you have, or if you have a mix of those different things, run each one through Apsona separately and use the backup file, which contains IDs, to do your final upload. On the next screen, your records will display grouped accordingly. From here, determine your master rule to tell the system how to decide which record should be the master, test one to start and verify that the merge went as expected, and then do the rest. Clear your temp field from the master record after you’re finished. My best practice is to clear a temp field after I’ve finished using it to avoid future confusion. Create an Apsona filter Temp Field = your value, and update all records in the filter to Temp Field = blank. You’re finished! There are countless use cases for temp fields, especially with Apsona and Demand Tools at your fingertips. Apsona, in particular, makes updating records such a breeze that I use temp fields multiple times a week. Do you use them? If so, please share your use cases!